For several weeks, students at Lockhart Elementary School in the Massapequa School District threw pennies, nickels, dimes and quarters into a large jar outside the social worker’s office. When the Pennies for Patients campaign was finished, that loose changed totaled $1,540. 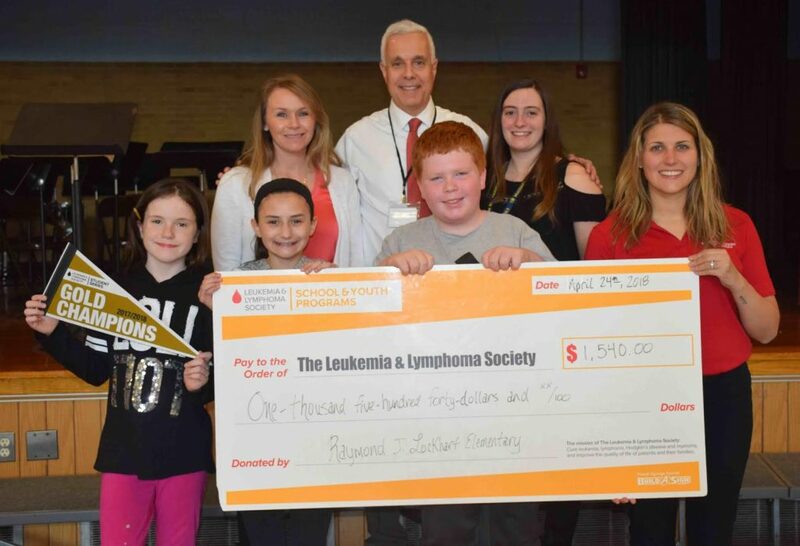 The school presented a check in that amount to the Leukemia & Lymphoma Society on April 24. Campaign manager Kerri Stein accepted the donation and thanked the students for their efforts. She gave the school a gold pennant. “With a small amount of change, when we all work together, we can make a big change,” she said. Ms. Stein explained that the money would help people across the country who are battling blood cancers. It will fund medical treatment, research for new medications, and comfort items for patients such as toys and blankets. Photo caption: Front row, from left, Lockhart Elementary School fifth-grade students Lily Curley, Arianna Micillo and Ryan Dempsey presented a check to Kerri Stein from the Leukemia & Lymphoma Society. They were joined by (back row, from left) social worker Kerry Rivera, Principal Stephen Scarallo and social work intern Nicole Delledera.